Despite its name, the Apollo 11 cave in Namibia has nothing to do with space exploration. It’s the location of prehistoric art, some of the earliest examples of art in human history, and it has provided us with a unique insight into the history and development of humans. The cave is situated in the Karas Region of Namibia, set on a high ridge of limestone in the Huns mountains, and overlooks the desolate gorge of the Nuob river. It is not far from the South African border. The entrance is wide, about 28 meters (92 feet) across, and the cave itself is deep: eleven meters (36 feet) from front to back. The roof slopes and its possible to stand upright in the front section of the cave only. The cave was first inhabited up to 30,000 years ago during the Mesolithic period , or Middle Stone Age, and from that time it was an active site of ongoing human settlement. This cave was ideal as it offered shelter and protection, and it also gave the inhabitants a vantage point from where they could monitor any threats in the surrounding area. The identity of the first people to inhabit it are unknown, but it is speculated that they may have been the ancestor of the Khoisan or San people, who are often referred to as the Bushmen. The Nama people, after whom Namibia is named, have been living in the area for millennia and they call the cave, ‘ Goachanas’, in their native Khoekhoe language. The story of the cave and its excavation is a remarkable one. It was first investigated by professional archaeologists in 1969 when a German team, led by W.E. Wendt, conducted a dig at the site. As the archaeologists were working on the site, news came over the radio that Apollo 11 had successfully landed on the moon and that the astronauts were about to walk on the surface. Wendt and his thrilled team decided to name the cave in honor of the spacecraft that landed Neil Armstrong and his colleagues on the moon’s surface. While working at the site, Wendt and his team discovered a fragment of rock with a partial image. It had been abandoned and was buried in the floor of the cave and each time the German experts returned to the cave they made many more remarkable finds, including the other half of the fragment of rock with an image they had found in 1969. The importance of the earlier finds and of the site itself became ever increasingly clear to historians as the artifacts were dated to around 25,000 years old. Excavations have resumed in recent years and more important artifacts have been found. The site yielded the oldest, and believed to be amongst the first, art mobilier (mobile art not painted on rock walls) found in southern Africa. The German expedition found seven slabs, more or less intact, and they are known as the Apollo 11 stones. These slabs or plaques are quartzite stones and they all bear traces of painted images and figures. The images have been painted onto the stones using a pigment that was derived from ochre, ostrich egg yolk, and other natural elements. We know that humans had the ability to make pigments at least 100,000 years ago. 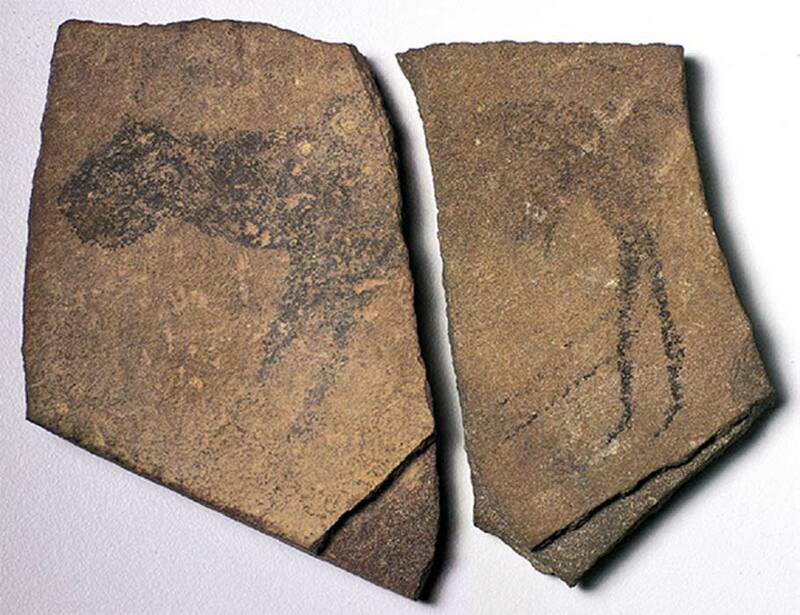 The slabs contain images of what appear to be animals and one possibly represents an antelope, a second may depict images of bees which are very common to the area and others are adorned with geometric patterns. The Apollo 11 stones are not the only examples of art that have been found at the site. Engravings have also been uncovered on the banks of the riverbed and there also appear to be images of animals and patterns traced on a large limestone boulder, although these engravings date from a much later period than those found in the cave. A recent dig has found two rather mysterious rib bones with notches on them. One bone has 26 notches and the other has a dozen, but what they represent is unknown. The incredible Apollo 11 finds are studied by archaeologists as well as those interested in the origin of art. These caves are situated in the Richtersveld Transfrontier Park, roughly 160 miles (260 km) from the town of Keetmanshoop, in south-west Namibia. Guided tours of the area are available, and travelers are advised to join one. Top image: Apollo 11 Cave Stones, Namibia, Source: Courtesy of State Museum of Namibia.